Are you tired of looking at that ugly stump in your backyard? There is no reason to put up with it anymore. AAA Tree Service specializes in stump grinding and removal. Our stump grinding experts provide professional stump removal services, offering the best and lowest cost stump grinding services throughout Orange County, California. Tree removal is necessary to eliminate dead and dying trees as well as those that have become hazardous. Removals can eliminate competition for light and space so that the remaining plants are better able to grow and thrive. Trees may also be removed to allow for new construction, home additions and to provide clearances with those structures. As part of the tree removal process the stump will typically be left as close to the ground as possible. Stump removal can be challenging and special machinery is required. Stump removal is necessary if the stump is a hazard or an eyesore. 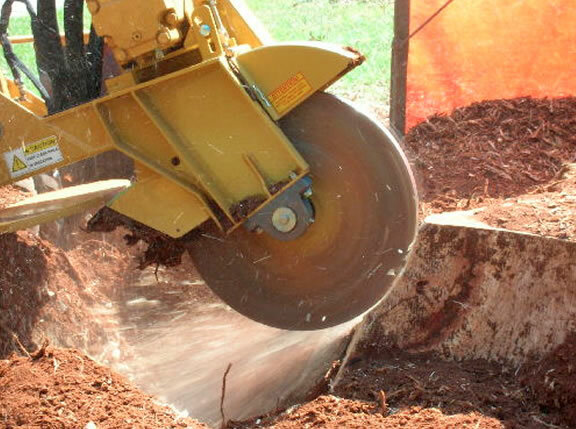 Stump grinding by a professional is the easiest and safest way to get rid of it. In most cases you want to grind the stump eight to twelve inches below ground level to allow for the planting of grass, shrubs, or a new tree. If the tree was very large there may also be outer roots at or above ground level that need to be ground. This will be discussed during our initial stump removal inspection. We will explain the scope of work and the costs involved clearly in advance. Once we’ve ground down the stump we gather the resulting wood chippings. We can either haul the chippings away or leave them for you to spread around your yard to keep your plants healthy and your yard looking sharp. Stump grinding costs will vary according to the size and location of the stump to be removed. Stump grinding is the perfect for Orange County residents who have had trees removed and are looking to get rid of any lasting remnants. It is a huge relief to have full reign of your yard and you landscape exactly what want. At AAA Tree Care our arborists are highly trained to work safely and efficiently in all tree and stump removals. We include thorough clean up of debris. We strive to minimize the impact to surrounding vegetation.